Sadly, after having Yoda for just over 20 years, he was put to sleep on 01/05/2017. He lost a lot of weight and muscle over a few weeks and on returning home we found him on the bottom of his viv not being able to walk on his left leg. While at the vets we found a golf ball size tumor in his lower abdomen. I hope Yoda enjoyed his life with us as much as we enjoyed him being in ours. 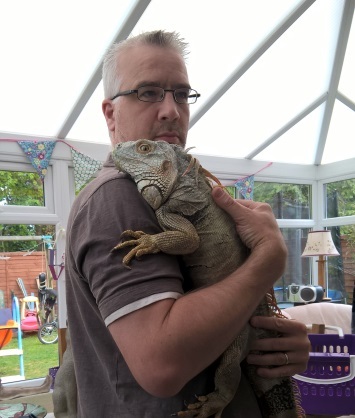 He has been through and seen a lot with us – numerous other pets – cats, dogs, salamanders, rabbits, guinee pigs, snake, giant millipedes and fish. Yoda has also seen us get married, move house and have 2 children, not to mention moving house 3 times himself. His website, YodaCam, had over 350,000 camera views and was online for over 13 years. I am so gutted to have lost a family member, nothing will be able to replace him. It will not be the same not seeing him looking at me as I walk down the stairs every morning, seeing him asleep on his shelf when I go to bed or having him look at me as I bring him his bowl of veg. Rest in peace big lad, you will be missed. 10 years ago today I launched Yodacam. Starting off as a bit of a laugh, I added an IP camera in with Yoda, so I could see him from work and see what he was up to. I then decided to add another camera as he was always in the wrong place. After a drunken discussion with a friend, I went and bought yodacam.co.uk and published him to the world! After a few years of monitoring for availability I purchased yodacam.com for him. Yoda has since moved house with us, and gained a new home, which is now on the back of our house in our conservatory, built around a window so that we can see him as we go up and down the stairs. I added a third IP camera in with him as there was more space and more to see. The 3 original IP cameras are still in with him, I am somewhat amazed that they are still going given the amount of heat they have to endure. Yoda is now around 18 years old, we got him in February 1997 when he was a few months old, hopefully he will be online for a good few years to come. I’ve had yodacam running for nearly 10 years now, recently I added a few pages for Rex, H`s corn snake so people could see them both, and for H to record shedding and feeding as a bit of a project. He kept asking me when it would be going live so he could tell everyone, which got me thinking about adding a webcam in with Rex. I got out all my IP Webcams out and got the smallest one I could find, made some authentication adjustments to the .Net code that pulls the image and put it in the corner of rex`s vivarium. I then decided to buy rexcam.co.uk so that Rex could have her own bit of web space, and H had more to tell people – for a few quid and an infrastructure that was already pretty much set up, a new logo, a quick copy, paste, ctrl-h and replace all, Rex had her own website ready to go. There is currently one webcam in with her and I’m working on adding a second, i just need her vivarium to be a bit bigger so that i can put the webcam somewhere out of sight or somewhere that is not that obvious. But for the time being, H is happy and he gets to show of his snake to everyone, and I guess that its all about making your kids happy isn’t it? Finally, after several years of waiting, I have been able to get the domain that I wanted to get for Yoda when I first set up his website. Probably not a sought after domain for most people, but for me it was. It looks like the domain was left to lapse, so I jumped straight on it. Yoda can now be seen at yodacam.com as well as yodacam.co.uk.